Ground shipment only. Not air ship-able. No express shipping. PACKAGING: Case of twelve 24 oz. aerosol cans, STRAW TYPE WITH STRAW. DESCRIPTION & APPLICATIONS: An aerosol dispensed fireblock grade polyurethane foam. Orange Tinted. FIRE-RATED: GREAT STUFF PRO has been evaluated by ASTM E 814* in wood frame pipe penetrations. Conforms to the ASTM C557-93, D6464, CA25-4, and is UL Class 1 (Flame spread of 15, smoke of 20). Fills, seals and insulates gaps up to three inches. The most economical, convenient and effective method for installing Building Code compliant Fireblocking in wood frame residential construction. Fireblock is used to seal concealed penetrations from floor to floor or room to room. Forms a fireblock AND a durable, airtight and water-resistant bond. 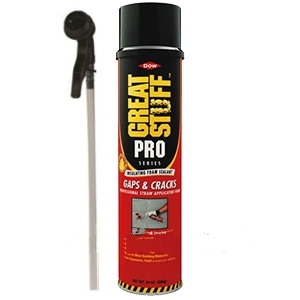 GREAT STUFF PRO is closed-cell foam. It forms a water-resistant outer skin when cured. Bonds to wood, drywall, metal, masonry, glass and most plastics. Tack free in six minutes. Trims in 30 minutes. Wide temperature operating range (25°F to 120°F). Most foams only work in 60°F to 90°F. Freeze/thaw stable. Foam elasticity allows for movement/shifting within a structure from winter to summer. Can be used to replace acoustical sealants on interior walls. Acoustical Rating: Sound Transmission Class rating of 69. Mechanical spring valve of GREAT STUFF Pro foam is superior to rubber valve. Won’t glue shut after use. Use 1/4 of the can today, 1/4 in 30 days, and that can will be good for…another 30 days! Choose from three foam applicator gun models. Extended length gun barrel available for easier application, such as sub-floor construction. GREAT STUFF Pro™ is approved as a residential fireblock sealing material (see ICC-ES legacy report NER-645). Replaces E136 Caulks, Mineral Wools and Solid Materials. Also meets ASTM E-84 Class 1 specs.